Before attending the Greece Mount Athos event in Clapham. 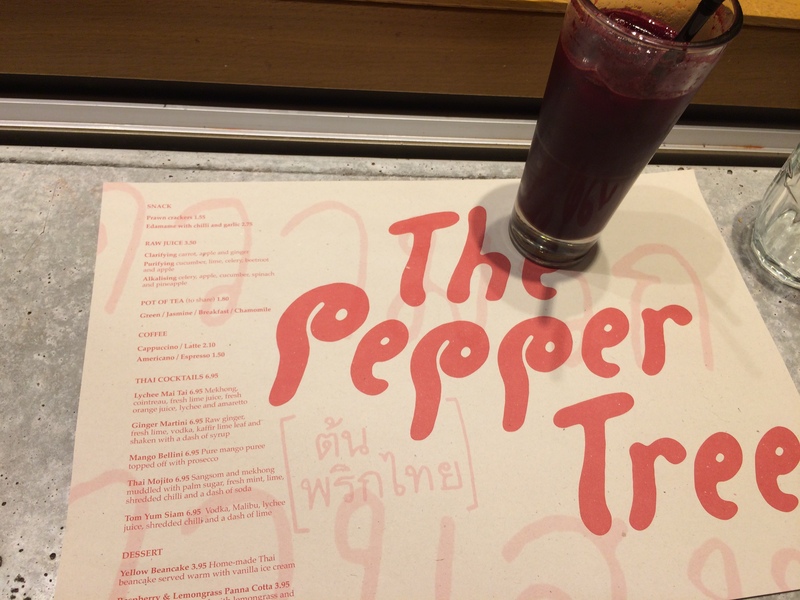 I stopped by The Pepper Tree on the long stretch of road for a quick bite. The Pepper Tree has been popping up on my radar for a long time. With my ex-colleagues recommending it, and foodies from around London mentioning the place. Recently the place has been refurbished and is under new management. This place is made to be all squished together with long communal tables, are filled throughout the whole restaurant. At the top end the open kitchen with manic cooks. Seated by the window, I had a quick glance over the printed menu. You have the usual Thai classics, curries, big bowls of soup, stir fries, salads, wok noodles and charcoal grilled meats. I knew when I saw the charcoal selections I had to order the food. Ever since I had the unforgettable taste at Kaosarn in Brixton, and has left a memorable mark on me. 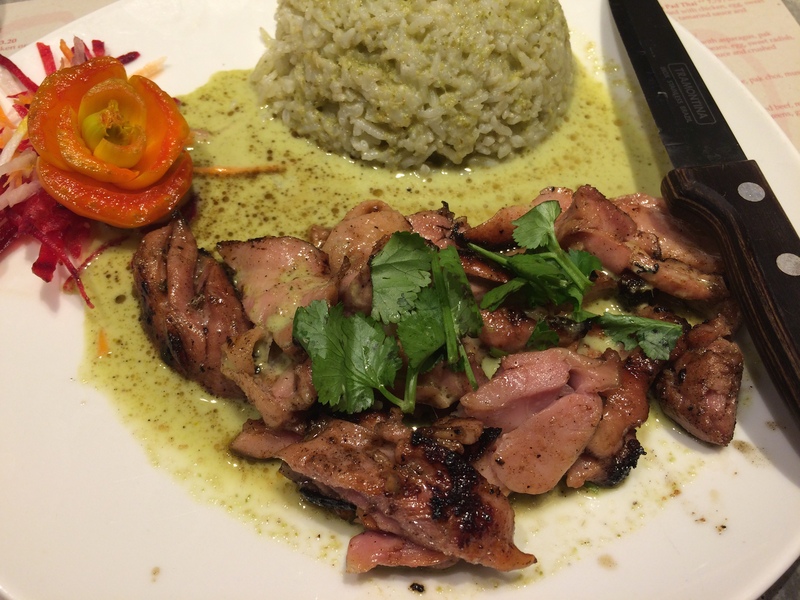 Battling against the choice of a chicken green curry or the chargrilled chicken with sticky rice. 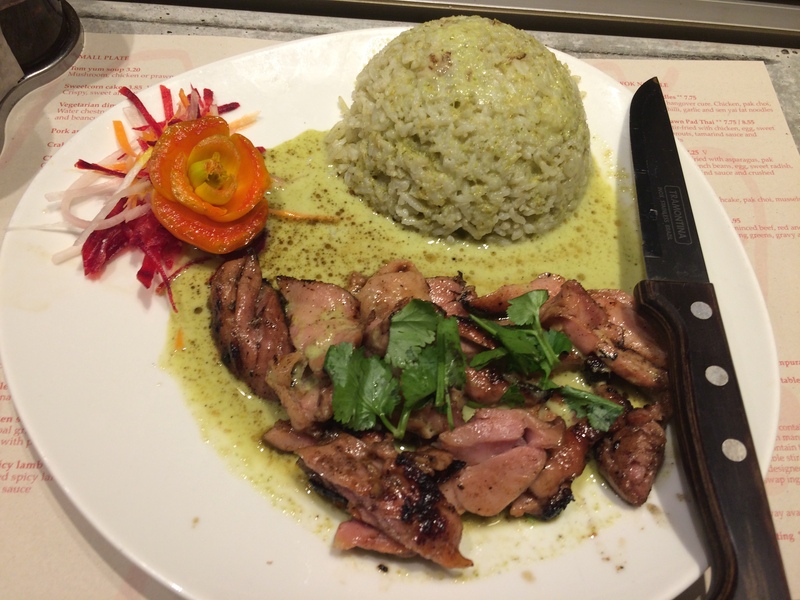 Lucky for me there was an option on the menu to have chargrilled chicken with green curry fried rice. I also ordered a homemade lemonade about a pint size that lasted throughout the meal. The dish didn’t take long at all to arrive and was totally worth the wait. Three-quarters of a chicken flamed grilled to a brownish caramelised colour, all sliced and laid out like a fan. A bowl of rice marked its place on the plate and the green curry in a side bowl. The chicken perfectly cooked, quite moist and only the ends were slightly overcooked and dry. Grazed in a taramind sweet flavour sauce, savor every bite, rip the meat from the bones. Pepper Tree version outdid Kaosarn for me. The service, however, was a real let down for me, it took 20 minutes to grab the attention of staff to pay the bill. I could have walked out and they wouldn’t have notice. Staff have been walking up and down the aisle without giving any eye contact.